Federal Aircraft Authority grants license for worldwide first parachute recovery system for gliders. 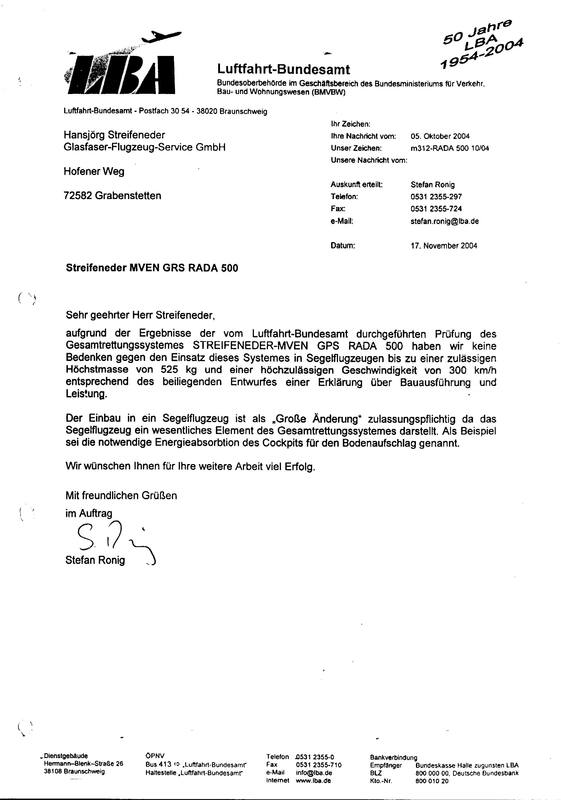 After a 10 years period of developing and testing the Federal Aircraft Authority grants the license for the worldwide first parachute recovery system for gliders namely the Streifeneder-MVEN GRS RADA. 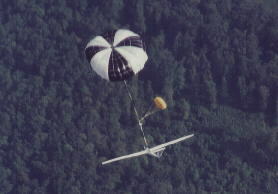 The installation of the parachute recovery system is licensed for gliders and motor gliders with a maximum aircraft weight of 525kg and a maximum deployment speed of 300km/h as far as the glider fulfills the additional airworthiness crash standards. A corresponding adoption by the manufacturer is required. The system proved its strength during several overload airdrops at a speed of 360km/h and an adherence loading of 600 kg as well as through tests with a free-flying pilot less Mosquito. By means of this flight tests we were also able to provide the evidence that no incorrect braking forces and torsional moments can appear at the airframe. Until now it has been almost impossible for the pilot to drop out of the cockpit and to touch down safety after a mid-air collision. Enormous forces and anomalous flight attitudes often caused the impossibility of a recovering jump. This security vulnerability has been closed now by our company with the newly licensed parachute recovery system for gliders. Currently, a wider adoption of the parachute recovery system depends on how customers will adopt the possibility to increase their own security as well as at what prices the manufacturers will offer the installation. Ventus 2b, ASW 28 und Discus will probably be the first glider types which will get the supplementary type certificate for the parachute recovery system. For further information about the parachute recovery system and the possibility of installation Hansjörg Streifeneder will always be at your disposal. We want to take the opportunity today to thank all those engaged participating companies, organizations, authorities, institutes and individuals. A special word of thanks is owed to Peter F. Seling for all the time he participated in this project. We hope for the continuation of this good co-operation and the successfulness of our parachute recovery system.